A ‘finger’ of the Universe’s dark-matter skeleton, which ultimately dictates where galaxies form, has been observed for the first time bridging the galaxy clusters Abell 222 and Abell 223 2.7 billion light-years away by an international team of astrophysicists using a technique that could eventually help astrophysicists to understand the structure of the Universe and identify what makes up the mysterious invisible substance known as dark matter. 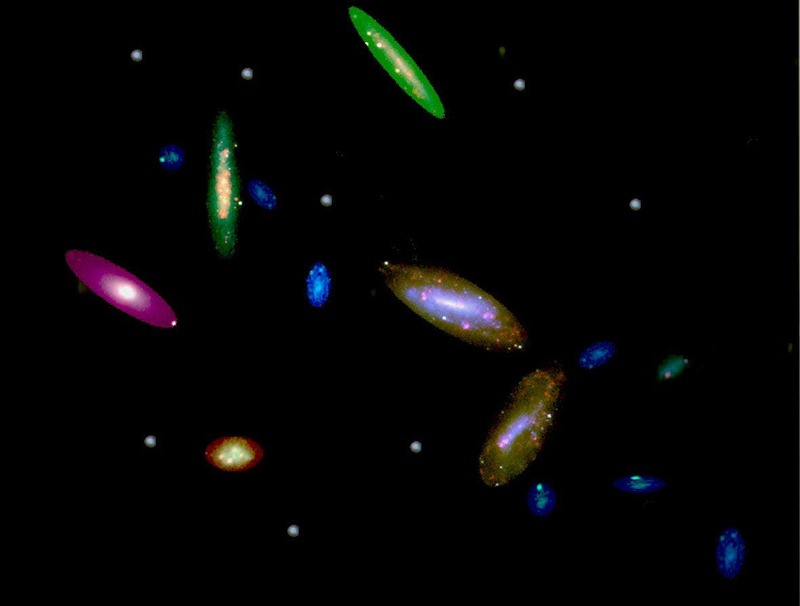 Using data from the Subaru telescope on Mauna Kea in Hawaii and the XMM-Newton space telescope, researchers examined 40,341 background galaxies for signs of distortion and calculated that the mass in the filament is between 6.5 × 1013 and 9.8 × 1013 times the mass of the Sun. They used a model to subtract out the masses of the galaxy clusters and then fit the remaining mass with a model of what a filament might look like. They found that a filament must be present, and that it was actually much longer than it seemed. The discovery of these dark-matter filaments, about 58 million light-years from end to end, are predicted to contain more than half of all matter in the Universe, was published online Wednesday by the journal Nature. According to the standard model of cosmology, visible stars and galaxies trace a pattern across the sky known as the cosmic web, which was originally created by dark matter. These long strands of dark matter bridge clusters of galaxies formed at the nodes of the cosmic web, where these filaments intersected. By examining X-rays from plasma in the filament, observed by the XMM-Newton spacecraft2, the team calculated that no more than 9% of the filament's mass could be made up of hot gas. The team's computer simulations suggest that roughly another 10% of the mass could be due to visible stars and galaxies, the balance dark matter, said Dietrich. 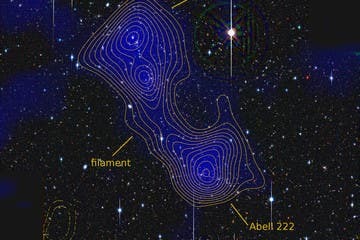 “What’s exciting is that in this unusual system we can map both dark matter and visible matter together and try to figure out how they connect and evolve along the filament,” says Mark Bautz, an astrophysicist at the Massachusetts Institute of Technology . “This will complement direct dark-matter searches, for example at the Large Hadron Collider,” says Alexandre Refregier, a cosmologist at ETH Zurich, the Swiss Federal Institute of Technology in Zurich.